It’s not every day that students walk out of Leigh Anderson’s class at Rosemount High School looking like extras from a disaster film, but it’s all in the name of education. The art of “moulaging,” or applying fake wounds, is just one of the unique learning experiences for students in Anderson’s emergency services class. Emergency services is one of several medical and health care careers classes that are offered through the district’s Career Development and Enrichment Opportunities Program. The 18 career development classes, ranging from animal science to vehicle services, are offered at one high school but are open to students at all District 196 high schools. 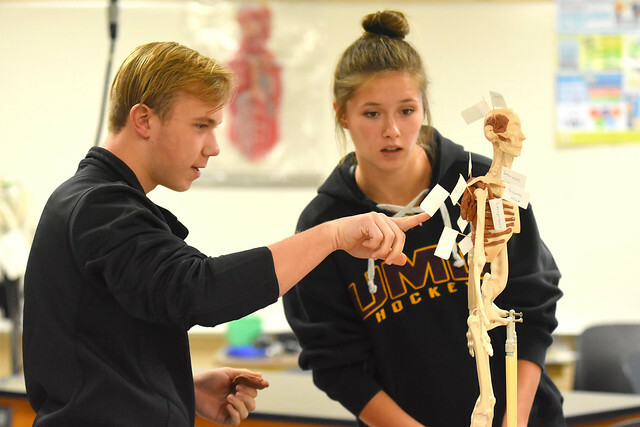 About 20 years ago, Anderson, a Rosemount firefighter/EMT, and Patti Drew, a District 196 biology and chemistry teacher, started a forensic science unit after seeing a growing number of students entering the public health and safety field. Soon after, they recruited Judy Kilgore, educator-turned-registered diagnostic medical sonographer in abdominal and vascular, to add the health care piece. The emergency and health care career fields are some of the fastest growing industries. And the demand for workers continues to rise. As students begin exploring careers earlier in high school, Anderson said the program is important in helping them decide if the health care field is – and in some cases, may not be – right for them. The elective attracts all types of students, from those interested in pursuing a career in medical or public safety to those who are getting their first exposure. It starts with a firm understanding of the sciences behind the careers. Students get lessons in biology, chemistry, anatomy and physiology. They learn about the human body and the intricacies of the organs and ligaments. Kilgore said one of the best tests of a student’s grasp of the content is molding muscles onto skeletons. The program gives students the opportunity to go beyond their textbooks and experience what it’s truly like in the field. The forensic science students often invite speakers to share more about their professions. They’ve heard from lawyers, law enforcement officials, an Alcohol, Tobacco and Firearms agent and the Hennepin County medical examiner. “The exposure piece of this is critical to helping students see that this isn’t just what you see on television, but what it really takes to be in this profession,” Kilgore said. Similarly, students in the medical and health care courses take regular field trips to hospitals and clinics, and shadow professionals for a more up-close-and-personal experience. Back on school grounds, they also have access to an ambulance, which was donated several years ago. They use it to run mock drills, work with instruments and immerse themselves in an environment that mirrors the real world. Many of the career development courses offer students the opportunity to earn college credits and certifications. Both emergency services courses prepare them to take the exams required to be a certified EMS first responder or emergency medical technician.